Specially commissioned and designed to our exacting specifications, MS Charles Dickens is, without doubt, one of the world’s finest river cruise ships. We have worked tirelessly with one of Europe’s most experienced and respected luxury shipbuilders, Veka Group, to create the perfect ship, featuring many unique, ground breaking innovations. The finest of materials have been used in construction with virtually no expense spared; its sustainably sourced tropical hardwoods, highly polished brass and wrought iron fittings, thick pile high-quality carpets, luxuriously comfortable deep armchairs and settees will absolutely delight you. In addition the ship’s spacious layout, subtle and tasteful lighting, elegant décor, luxurious cabins and excellent facilities are undoubtedly the very best on cruise ships today. Superb attention to detail continues outside the vessel, where the extensive use of glass and polished stainless steel complements her sleek modern profile perfectly. As the ship glides, serenely through the water, she truly is a wonderful sight to behold! As you would expect, the ship also incorporates the very latest in modern construction techniques and safety systems, ensuring your cruise is as comfortable and secure as possible. Finally the ship carries just 140 passengers and with 35 crew, a 4:1 ratio ensures excellent service levels. With many similar size vessels carrying 180 passengers or more, you will find the extra space, especially in the restaurant, very noticeable indeed. The four-deck design helps to enhance the ships' spaciousness and is typified by the delightful lobby on the Upper deck. As you are greeted on board, you will appreciate the five-star quality of the warm-coloured wood and marble that has been extensively utilised, whilst above, the innovative atrium tastefully bathes the whole welcoming scene in natural light. There is also a lift and small boutique stocking those essentials which always run out whilst one is away! Moving towards the front of the ship you will find the classically appointed lounge and bar, with a wide selection of comfortable and elegant seating. Here you can relax and enjoy the delights of the passing scenery through the superb observation windows on both sides of the vessel, whilst the forward facing panoramic bay window ensures the most extensive and uninterrupted viewing of any river cruise ship! The welcoming bar offers a full range of drinks sourced from all over the world, including the finest wines and spirits. When the sun sinks slowly below the riverside hills this is the perfect place to relax and reflect on another day’s experiences. Then, as the evening progresses into darkness, subtle lighting evolves through colour and intensity accompanied by gentle piano background music, creating a very special ambience. However should you prefer a good book to read you can always visit the library, which, with its leather-effect wall linings, offers a gentile environment reminiscent of the golden age of cruising. To the rear of the ship is the stern bar, with large panoramic windows and outside seating, where again you can enjoy and relax, watching the passing scenery. Here, in the evenings the chef presents his personal signature dishes for just 24 diners – this intimate dining experience can be reserved on board at no extra charge. Stairs and a lift lead down to the middle deck, where the culinary delights of a superbly elegant restaurant are enhanced by sparkling crystal and crisp, high-quality table linen. Here the ship’s outstanding chefs will amaze you with superb fine dining of the highest order, using freshly prepared seasonal produce to create very best of European cuisine. The sumptuous breakfast buffet, with omelettes and fresh eggs prepared to order, ensures a great start to the day and a lunchtime buffet ensures you can eat a full meal or something as simple as a fresh crunchy salad – just as you desire. The evening dinner features excellently executed dishes with silver service, plus a relaxed atmosphere and our ‘open seating’ policy that ensures your dining experience is one you will always look forward to. Wonderfully illustrating the extraordinary attention to detail focussed on the Charles Dicken's design is the use of special ‘sound absorbent’ paint on the restaurant ceiling to reduce noise levels whilst dining – remarkable! Another outstanding restaurant feature are the large tinted panoramic windows, so as you enjoy your epicurean adventure you will also be able to enjoy the scenery as it glides past – you miss nothing! A further staircase descends to the lower deck, where a small but well equipped fitness suite is available for the energetic, whilst others may choose to plump for an invigorating sauna! There is also a hairdressing salon so you can always look your best (small additional fee). Crowning the ship is the magnificent Sun deck, where you are very welcome to visit the Bridge whenever you wish except when berthing or navigating locks. You can discuss life on the river and view the fascinating technologically advanced array of ‘state of the art’ navigation and control equipment, whilst highly skilled officers guide all 110 metres of the Charles Dickens carefully along the river. Of course the view from the sun deck is just wonderful, whilst the informal café style seating is an ideal place to relax with like-minded travellers. 7 Night River Cruise sailing from Budapest roundtrip aboard MS Charles Dickens. Soak up all that Europe`s most cultured river has to offer, with its wealth of grand baroque architecture, medieval cities, picture perfect towns and the sights that inspired Strauss and Mozart. 14 Night River Cruise sailing from Budapest to Cologne aboard MS Charles Dickens. 7 Night River Cruise sailing from Cologne to Basel aboard MS Charles Dickens. 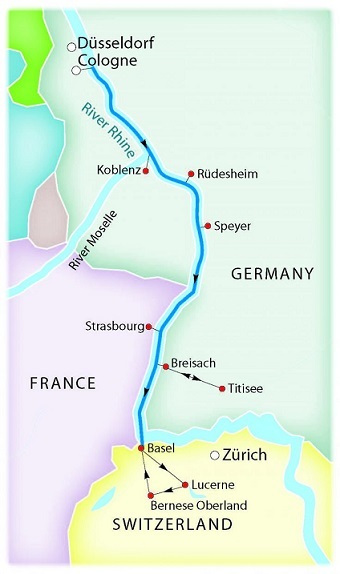 7 Night River Cruise sailing from Basel to Cologne aboard MS Charles Dickens. The cabins are very tastefully appointed, featuring a wealth of mahogany, leather, marble and Italian soft furnishings, which blend together to create an ambience of true quality and elegance. In keeping with this theme, spacious marble bathrooms have a washbasin with plenty of space for cosmetics, a WC and a glazed shower with fittings by ‘Grohe’. Cabins on the upper and middle decks have “French Balconies” with full floor to ceiling glazed doors. These have another unique innovative feature – a first on any river cruise ship. The doors slide completely away against the ships side, effectively disappearing from view (excepting the safety barrier of course! ), thus creating a true panoramic extension to your already large cabin area. From here you can enjoy the delights of fresh air and magnificent views whilst retaining your own privacy. At 15 square metres (161 square feet) cabins are spacious (amongst the largest on European rivers) and well appointed with hotel standard beds (not bunks or berths), safe, telephone, hair dryer, tea and coffee making facilities plus individually controlled air-conditioning. They have flat screen TV with satellite channels and also receive images from a bow-mounted camera, so you can see exactly where you are cruising from the comfort of your own bed! Two chairs and a small table are provided for your convenience plus an umbrella for those hopefully rare, showery days. Tasteful lighting, subtly changing in harmony with the time of day is again a unique feature, whilst high quality bathrobes and slippers add the final elegant touch. Cabins on the lower deck are slightly smaller than the top and middle at 14 square metres (151 square feet), but feature the same amenities apart from one armchair and table and have smaller, fixed windows. Cabins for sole occupancy are available on this deck at no supplement (subject to availability).